NAOHOA isn’t just about getting a tattoo, it’s about having a positive, empowering experience whilst marking your body with art that will stay with you for life. It’s natural to feel nervous or even anxious before going under the needle, which is why I’ve compiled some helpful tips you can apply NOW in order to have a calm, peaceful mind. Disclaimer: I am NOT a trained well-being coach or affiliate of any of the companies suggested here. The purpose of this post is to help clients by sharing practical tips I’ve learned over the years. Any action you take upon the information on this website is strictly at your own risk. Meditation is the act of being still and observing and as little as 15 minutes a day can have a positive impact on your wellbeing. …in a comfortable position with your eyes closed. Imagine your body being scanned from the top of your head right down to your toes. In your mind, follow the light as it travels down your body…how does that part of your body feel? You might notice that certain muscles ache more than you realised, or that you feel tiredness in your forehead or other parts…or that you feel grand all over! Either way, this exercise will help you identify the current state of your body and mind. If you’re feeling achey, how about treating yourself to some TLC? 🙂 Regular stretches (e.g. Yoga), a muscle-relaxing bubble bath or massage* can go a long way! Deep Tissue/Sports Massage = fixing. It’ll hurt, but it’s worth it if you have built-up tension. A good masseuse will teach you stretches to alleviate your problem points too. …at a slow-moderate pace and consciously being aware of the environment you’re travelling though. What’s the ground like? The sound of leaves crunching under your shoes or people and traffic passing by…how does the air change from one place to another? When we slow down, our eyes take in more light and process the imagery around us more vividly. By doing this activity alone, the world becomes so much more beautiful. …whilst concentrating on each sensation that passes. Is what you’re eating crunchy? Soft? Chewy? What does it taste like? Notice how it changes the longer you chew it and how it feels as it goes through your body. It’s too easy to have something playing on a device or read an article with your meal as a distraction, but try to take a moment only for yourself and the food. Enjoy it wholeheartedly – appreciating its taste, texture and that we have any at all. Gratitude grounds us every time. Traditional meditation (the one we all picture: where monks sit down cross-legged) involves you to be both mentally and physically still. The idea is to let all sensation pass by without judgement. Got a niggling thought that keeps popping into your head? That’s alright. Acknowledge its presence and leave it be. Don’t invite it in to ruminate but also don’t push it away. Simply leave your thoughts be and let them drift in and out of your consciousness. Is someone making a weird, annoying noise? Or maybe there’s loud construction work going on. S’all cool. It’s a sound that’s happening outside that doesn’t concern you, so don’t let it. If you’re feeling frustrated regardless, that’s okay. Acknowledge that feeling, give it a nod and move on. Imagine a pond where the water is still and there’s a tree that hangs over it. When thoughts occur, it’s like a drop of water from the leaves landing on the pond. The ripples interrupt the calm, stillness. If you interact with your thoughts, it’s like shaking the tree – more drops fall, disrupting the pond even further. If you leave things be, the ripples will eventually dissipate and all will be clear again. Remember, the goal is to be in the present moment. Not ruminating over the past or planning or fretting over the future. Here, now, and only now. Like doing weights or learning to do a full press-up, it takes time and discipline to get those muscles into shape. If 15 minutes a day or more is too much to handle, try starting with 2 minutes a day for a week….then 3 minutes a day for another week, etc. Starting small means you’ll have less pressure to start, and once you build up the habit, it becomes second nature. Download the Calm app to use this on the go. One way to slow down a racing heartbeat is to breathe out longer than you breathe in: i.e. breathe in for 4 seconds, hold for 2, then out for 6 seconds. The act of doing this and concentrating on counting and breathing alone should help you find your centre. Feeling distracted? Find a recurring sound nearby and focus purely on that (…assuming you’re not doing something important, like driving!). Whether it’s birds chirping, rain pattering against the window or one element of a song; zoning out and focusing on one single thing can curb rushing thoughts or emotions before they spiral out of control. Personally, I enjoy listening to Classical music as it helps me stay calm and focus on the task at hand. Sometimes, I’ll put all my attention to one part of the piece – i.e. one instrument. “Only listen to the flute” or, “concentrate on the bass line”…not only does this deepen my appreciation and learning for music, it calms my mind by diverting it from unhelpful thoughts that could spiral down a negative path. If you feel there is a deeper issue at hand, check out Mind.org.uk or helpful advice or contact your GP for a referral to local, professional help. Although it’s dependant on quality of counsellor, I highly recommend Cognitive Behavioural Therapy (CBT). It’s very much a “you get what you put in” course that’s absolutely worth the effort. The more honest you are with your therapist, the more effectively they can help you. Want To Support Mental Health? 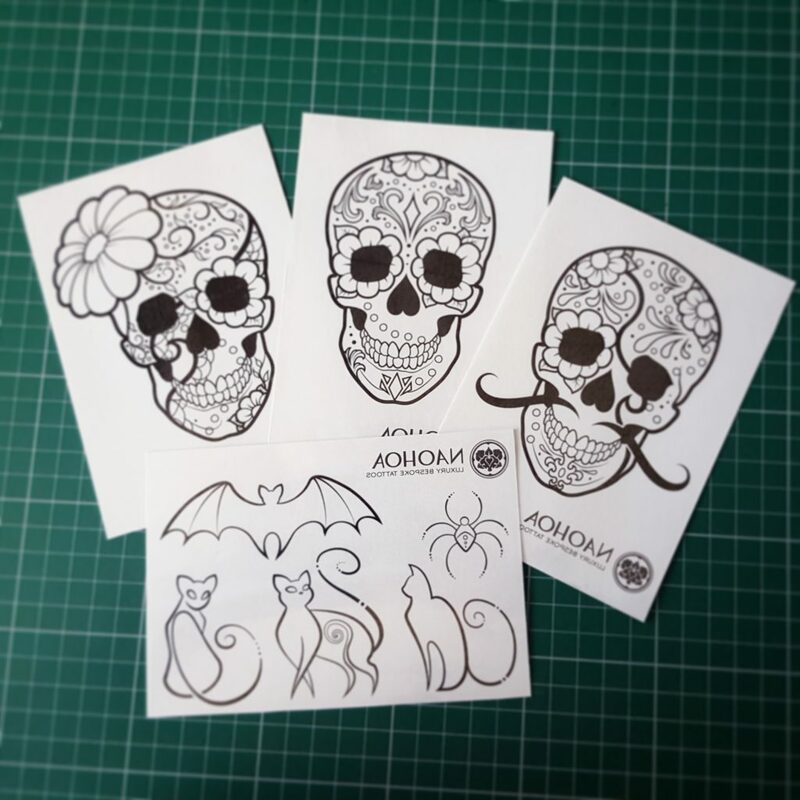 Throughout October 2017, I’ll be selling Halloween Temporary Tattoo Packs and colouring pages to raise money for Mind.org.uk! You can buy them via the website, Etsy or in-store. My aim is to raise £100 by the end of the year! Thanks for reading, folks. I hope this was helpful to you and that you take some time out to look after yourself. 🙂 If you think this would benefit someone you know, please pass it on!